Renovations – we’ve been busy! Sometimes renovation just means cleaning. 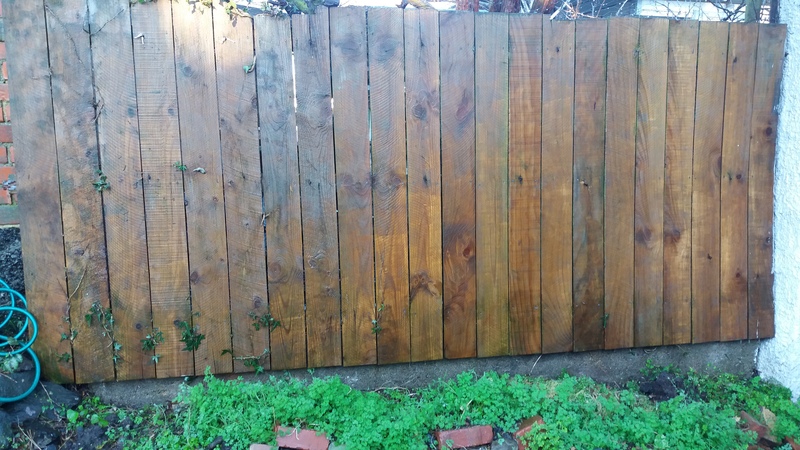 On the weekend, my partner and I tackled the back fence. It had clearly never been cleaned in a long time. 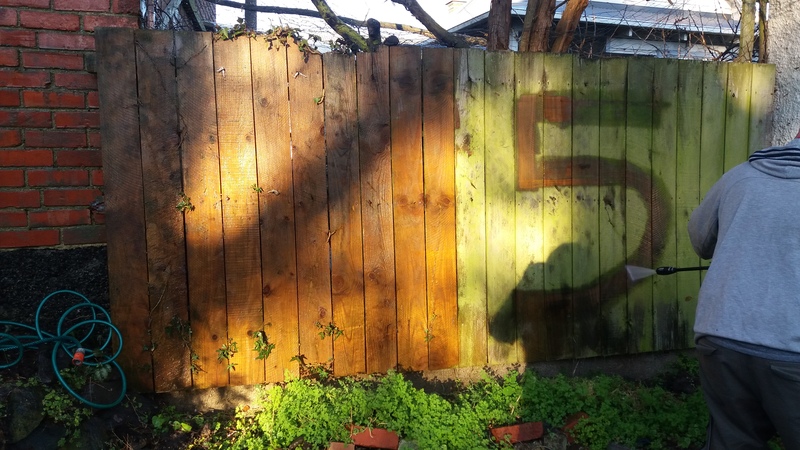 There was an old trellis supporting some scrawny, nondescript plants, and the wood was covered in green mossy built up from years of neglect. I snipped off the daggy old metal trellis with a pair of bolt cutters. The cutters made short work of the old plastic-coated metal. Bolt cutters are one of my favourite tools – I always feel like a superhero when I’m bolt-cutting something! Usually I like to salvage materials where possible, but the trellis was probably 30 years old, and no good for anything except disposal, being plastic-coated. It has gone to landfill now. 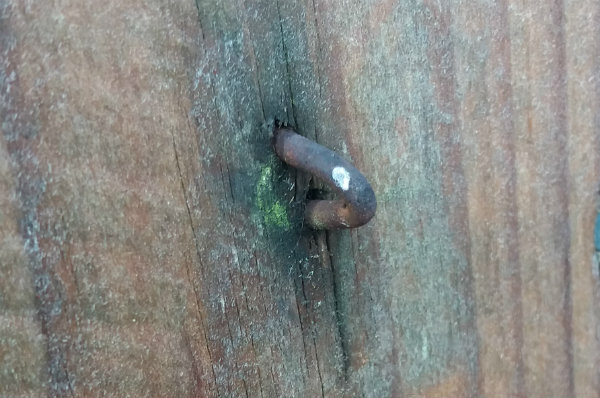 I left the old fencing nails that had been used to attach the trellis in the fence. They were well nailed in, and pulling them out might damage the fence. Besides, they blended in and didn’t bother me too much once the trellis was gone. Sometimes it’s better to leave old nails in place. If I’d desperately wanted to remove them, a quick snip at the elbow with bolt cutters before teasing the ends out with pliers would do the trick. The old plants were snipped apart with a pair of secateurs (they weren’t very big plants! ), and went into the compost, not being large enough to burn. One of the plants was a rose, so I cut it down to the base, and will dig up the root stock and transplant it. A job for another day! 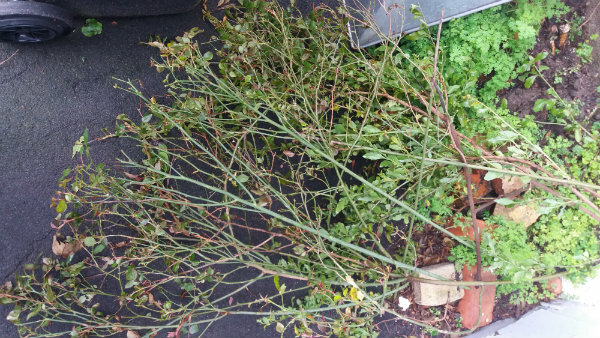 The rose bush and other plants hadn’t been pruned in a long time and were no good. I’ve saved the rose root stock though, and will transplant it elsewhere. The water blaster was the perfect tool for the job of fence-cleaning and removing all the green built-up.It was pretty filthy! Half the back fence done. My partner Matt got a bit bored and started “drawing” with the water blaster in the moss build up. Could’ve been worse – at least it was just a number! There! Two hours later it’s much better! Looks like a new fence now! So much better! Just one afternoon of work can make a huge difference. Looking after a house and garden and keeping them in good order is often just a matter of easy jobs performed regularly. It’s also a matter of having the right tools. A water blaster made this job really easy, but if we didn’t have one, we’d have used scrubbing brushes and soapy water – plus elbow grease. Over the next year we have our work cut out for us. We’ll be painting the entire house, inside and out, and remodelling a bathroom that is truly antiquated. Plus we’ll be doing a lot of gardening, making our outdoors a lovely place to be.